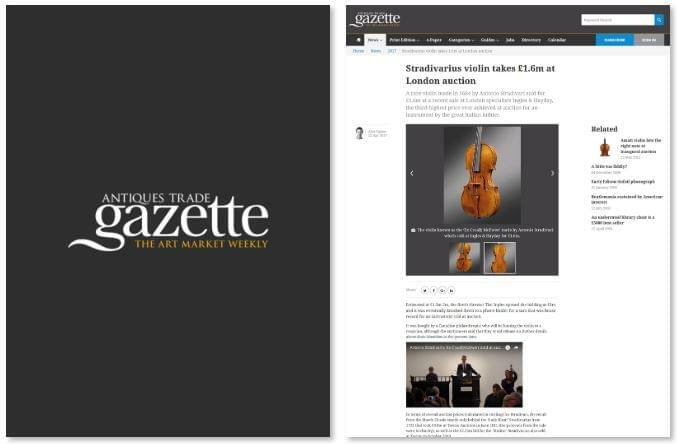 A rare violin made in 1684 by Antonio Stradivari sold for £1.6m at a recent sale at London specialists Ingles & Hayday, the third highest price ever achieved at auction for an instrument by the great Italian luthier. Estimated at £1.3m-2m, the firm’s director Tim Ingles opened the bidding at £1m and it was eventually knocked down to a phone bidder for a sum that was a house record for an instrument sold at auction. It was also the highest price ever achieved for a Stradivari from the 1680s at auction. It was bought by a Canadian philanthropist who will be loaning the violin to a musician, although the auctioneers said that they could release no further details about their identities at the present time. In terms of overall auction prices (calculated in sterling) for Stradivari, the result from the March 28 sale stands only behind the ‘Lady Blunt’ Stradivarius from 1721 that took £9.8m at Tarisio Auctions in June 2011 (the proceeds from the sale went to charity), as well as the £2.25m bid for the ‘Molitor’ Stradivarius also sold at Tarisio in October 2010. ATG understands that a number of other Stradivari have changed hands privately for sums up to £10m. In the weeks leading up to the sale, the auctioneers produced this promotional video. Known as the ‘Ex-Croall; McEwen’ violin (after two of its former owners), the violin at Ingles & Hayday had a distinguished provenance but also an interesting recent history. It had been used by Frank Peter Zimmermann between 1985 and 1990 – the German violinist played it in around 250 concerts and all of his recordings on the EMI Classics and Warner Classics labels during this period were performed on this violin. In 1995, it was acquired by Westdeutsche Landesbank of Düsseldorf – the German bank that later, after its debts mounted due to the credit crunch, had its assets transferred to the Federal government’s financial supervisory authority before being finally wound up in 2012. The bank’s collection of musical instruments was since taken over by another institution which consigned it to the sale here. Its traceable history goes back to the 19th century with its first known owner being the Scottish noblewoman Countess Seafield. It was then sold in the 1880s to a Mr William Croall from Edinburgh, the son of a wealthy family of carriage makers and an amateur violinist. On Croall’s death in 1906, the violin was sold to his friend Frederick Smith, another collector of great violins who subsequently sold it to the musical instruments dealers W.E. Hill & Sons who sold it to a Mr. R.F. McEwen. It later appeared at an auction at Sotheby’s in London in 1968 as part of the property of the Countess of Scarborough where it sold at £9500. Antonio Stradivari’s violins from the 1680s are rare in any case and this was considered a fine example in exceptional condition – its back was crafted from a single piece of maple and it still retained Stradivari’s trademark golden varnish. As well as Frank Peter Zimmermann, other notable performers who have played the violin include Alexander Gilman and Suyeon Kim. The sale overall generated a premium-inclusive £4.6m, a record for an auction at Ingles & Hayday and also the highest for any London fine instrument auction since 2011.